No one doubts that Cannes is, indeed, a place where luxury dictates the code to every aspect of the tourist activity in the city. In this respect, it’s only natural for this French Mediterranean resort to implement the rule of luxury in the field of accommodation services, in view of complying with the expectations of its world renowned visitors. This is why the few 5 star hotels in Cannes have been designed, fitted and provided with everything necessary in view of satisfying even the most refined whims of the rich and the famous. 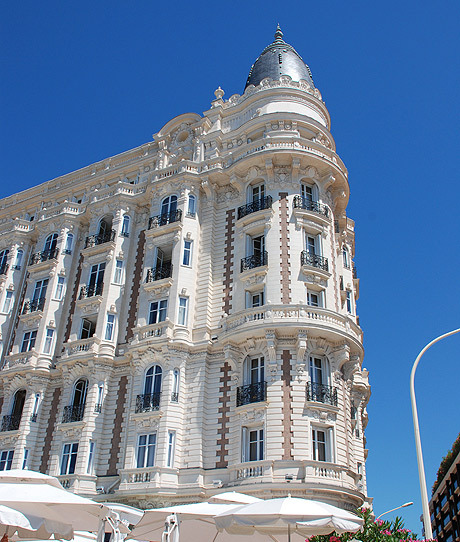 In this respect, the reputed Boulevard La Croisette is, again, the one which delineates the lay out of the four luxury hotels in Cannes, proving to be the backbone of the city in terms of establishments offering accommodation services. To begin with, Intercontinental Carlton Palace Hotel makes available an impressive series of services and amenities, in order to make guests’ stay as complete as possible. Business travelers are just as welcome here as pleasure travelers, and this is why Intercontinental Carlton Palace Hotel takes pride in putting forward 12 meeting rooms of which the largest has the capacity of hosting 650 people. The hotel’s first floor hosts a health and fitness center also providing beauty care services, and a work out center fitted with cardio training facilities. The Carlton Restaurant does not fall short of the general expectations the hotel’s guests might have with respect to its gastronomic performances, meals being served and enjoyed in an atmosphere replete with good taste and style. The Carlton Beach Restaurant mirrors the excellence of its indoor counterpart, from April to October. The Carlton private beach enables a series of water sports activities, which should be enough for accomplishing a perfect day at the beach with a touch of privacy and exclusiveness. Hotel Majestic Barrière also impresses its guest with one of the finest formula of services and amenities. It is one of the top options in terms of luxury accommodation venues since, first of all, it faces the famous Palais des Festivals, and it makes available some 265 rooms and suits, of which two are penthouses. The two restaurants and the two bars of Hotel Majestic perfectly blend in the luxurious dash of the establishment, whereas the private beach, the two casinos, the shopping mall hosted by the hotel, the spa and health center, as well as the outdoor pool complement the guests’ stay at the Hotel Majestic Barrière. Business travelers are not disregarded by the hotel, which offers to them 15 meeting rooms and other similar facilities in view of enhancing their activities. As a particular feature, Hotel Majestic Barrière knows how to take care of the kids, keeping them busy at the children club it owns. The view opened by Hotel Palais Stephanie is among the most ravishing in the entire Cannes, presenting the breathtaking panorama of the Bay of Cannes and of the Lérins Islands. The 261 rooms and suits are conceived to sate even the most unlikely tastes for elegance and luxury, a feature which is also implemented in the way the 15 meeting rooms and the one auditorium are arranged. The two dining venues and bars of the hotel, besides the excellent dining and lounge services they offer, yield the best sights one can expect on the rooftop of any building in Cannes, whereas the casino, the swimming pool and the Jacuzzis – both on the roof of the hotel – not to mention the fabulous private beach are meant to make all guests sample and enjoy luxury in its utmost climax. What makes Hotel Martinez unique is the fact that it manages to combine extravagance and grandeur into a formula which has been lasting for almost a century. This hotel has a capacity of more than 400 rooms and suits, but guests are from the beginning easily impressed by the sumptuous entrance and lobby which, in fact, substantiate the taste for what is the utmost refinement in terms of reception infrastructures. The hotel also boasts 3 of the finest restaurants in Cannes, namely, La Palm d’Or, Le Relais Martinez and the Zplage Beach Restaurant. The ownership of a private beach goes without saying, but the fact that it is considered one of the top beaches on La Croisette adds a plus to the general dash of the hotel. Hotel Martinez also makes available 15 meeting rooms to service the needs of business travelers, and the overall picture of this venue is duly complemented by a heated pool, a piano bar and a considerable lounge area.